I was a novelist before I was ever an academic, and I remain a writer by temperament and aspiration. In the 1980s, I published three historical novels with Robert Hale, but after my mother’s early death in 1983, I didn’t write for a long time, and when I began again my writing had become more serious and complex. In 1990 I returned to the formal education I had never completed and entered the University of Nottingham as a mature student, taking my BA, MA, and PhD in English Literature. I stayed on at university as a teacher, lecturing in language studies and running my own course in Creative Writing. While I was studying for my degrees, my own writing had to take second place, but it never went away. I continued to develop my understanding of the craft of writing, publishing poetry, reviews and short fiction in the small presses, both print and online; but I returned to the challenge of full-length works in 2005, when I embarked on the Creative Writing MA at Nottingham Trent University. My recently published novel The Esplanade (Weathervane Press, 2014) is about loss of voice and identity. 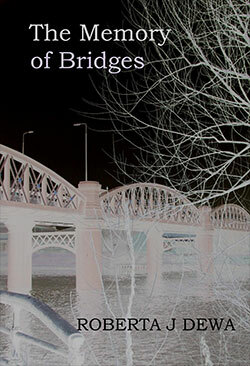 And my memoir The Memory of Bridges, (Glass Tortoise, 2013) narrates the reclamation of a troubled past, and a return to the village of my childhood. Extracts from both works can be read on this website. My novel in progress about a group of people who find themselves set adrift by society is moving slowly onwards. There is a strong mental health focus on this novel, and describing the inner lives of characters who have suffered much in various institutions is something which doesn't just require research, but an immersion into their minds which can be draining. So I'm glad to be able to vary the diet with short story writing and the occasional poem, along with working with my fiction group - keeping connected and sane during the long haul! In November 2017 I was delighted to hear that my story, 'Dark Song,' had won the International Willesden Herald Short Story competition; details at www.newshortstories.com. The competition anthology is now available 'New Short Stories 10', and features some great and varied short story writers. I shared a reading night before Christmas at the Malt Cross, Nottingham with two excellent writers, Giselle Leeb and Frances Thimann. Giselle's work has been extensively published in the short story world, and last year her story 'As You Follow' appeared in Salt's Best of British Anthology. Frances has published two short story collections with Pewter Rose, and her story 'Shells' won the Society of Authors' Tom Gallon Award. It was great to celebrate the short form in convivial surroundings. The same summer I was very pleased to be Commended in the Writing East Midlands competition for my poem, 'Something like Dawn.' 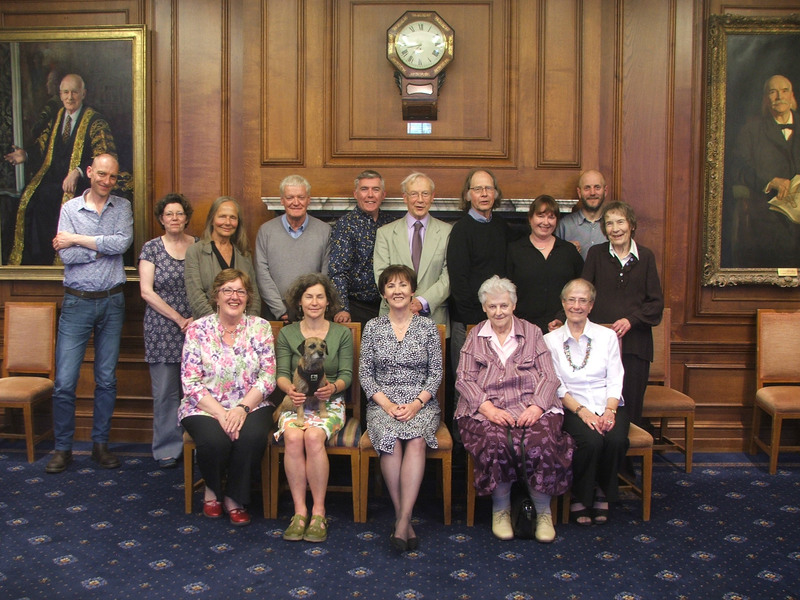 On the longest and hottest day of the year some splendid writers gathered at beautiful Bromley House Library to hear from the prizewinners and commended entries in the competition. The event was ably organized by Bromley House and Jacqueline Gabbitas of WEM; thanks Jacqueline and of course Penelope Shuttle and Jacob Ross, the judges for the competition. You can read the anthology of winning and commended entries on the WEM website; go to www.writingeastmidlands.co.uk. 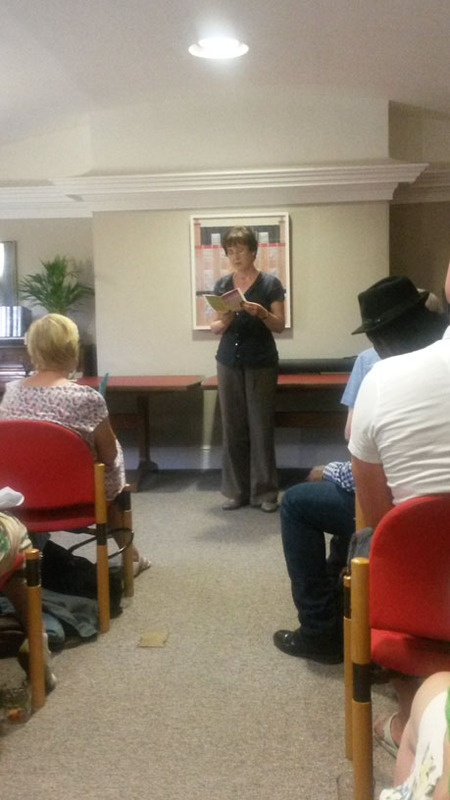 For now here's a photo of me reading at the event. It seems a long time now (actually just two years) since I retired from the University of Nottingham as a lecturer at the end of the academic year, and as with other stages in my career that have been significant, there has been both sadness and celebration - a time of loss and a time of freedom, both of which are testing. But as someone who entered the university as an undergraduate at the age of 36, I remain a passionate believer in lifelong learning, and keeping all those interests going - you never know where they will lead you! 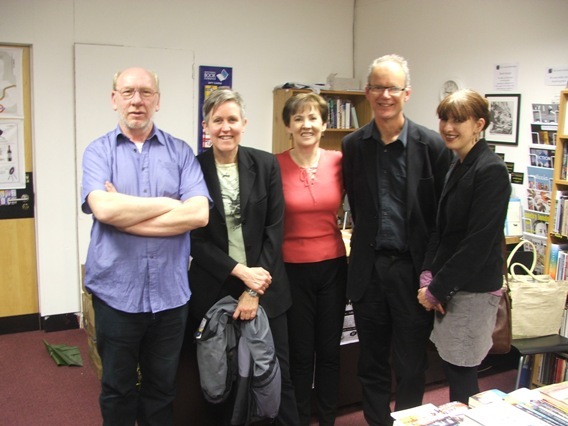 (Below, publishers and writers: Ross Bradshaw, Giselle Leeb, Robbie Dewa, Ian Collinson and Megan Taylor). Last year I was pleased to have the memoir longlisted in the Mslexia Memoir Writers Competition, and although it's been a while now since its publication it will be good to revisit all things memoir at the course for Writing East Midlands (see top of this news column for more details). Back in the city, there are always great events featuring writers local and not so local at Nottingham's new independent bookshop, the Five Leaves Bookshop in Nottingham. Check out www.fiveleavesbookshop.co.uk for more on these. Some time ago I was interviewed on the subject of memoir writing by Elaine Aldred for her splendid blog, and the interview is available in her archive: see http://strangealliances.wordpress.com for this and other fascinating stuff about the process of writing. I was also recorded on video by Andrew Kells of the Nottingham Writers' Studio (thanks Andrew!) reading an extract from my memoir; this should be accessible on Youtube. An unusual experience with the camera as audience! Since the launch in 2013 of the memoir at the Meadows Library in Nottingham I've learned a lot about trying to promote my work. Most of all I've learned how generous writers and book lovers are, and how much help and support they give to one another. 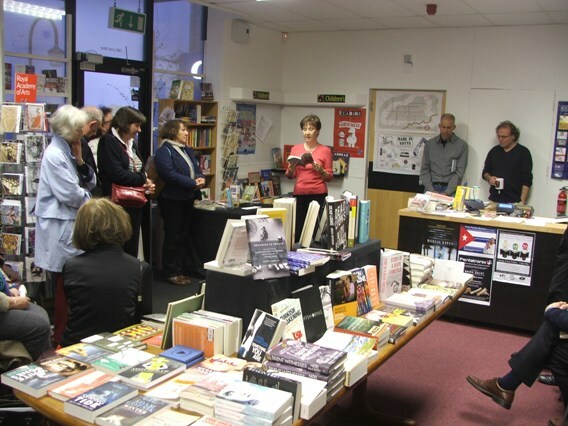 The launch was a very special moment for me, held in the library where both I and my mother worked, and where my mother met her first fiance during the war, but it was also special to have all those friends from the writing community and elsewhere present. Thanks again to everyone who came, and also to those who have since bought the book - and of course to my husband Peter for endless help behind the scenes! 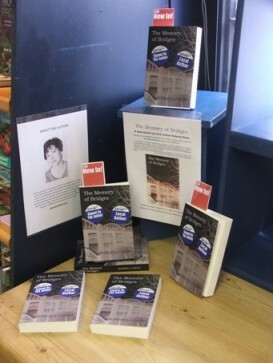 If you are interested in the memoir, and would like to know more about the book and how you can get hold of it, you can email me through the contact page, info@robertadewa.co.uk., but the book is also available from The Bookcase, Lowdham, a really excellent bookshop, (www.thebookcase.co.uk) and can be ordered from Stray's in Newark, where they have not only lovely books and staff, but also a cafe and jazz events (check out www.strayscoffee.co.uk and www.straysbooks.co.uk). It's also now available at Five Leaves Bookshop in Nottingham.